Ashley Hernandez is a marketing associate at Napa Technology, a hospitality company based in downtown Campbell, California. Napa Technology is the worldwide provider of the most effective intelligent wine preservation and dispensing technology. In her position, she creates social media campaigns, flyers, blog posts and marketing campaigns, and manages the communications interns. Prior to this position, she worked as a marketing intern at John Wiley & Sons in San Francisco, a global publishing company that specializes in academic publishing. 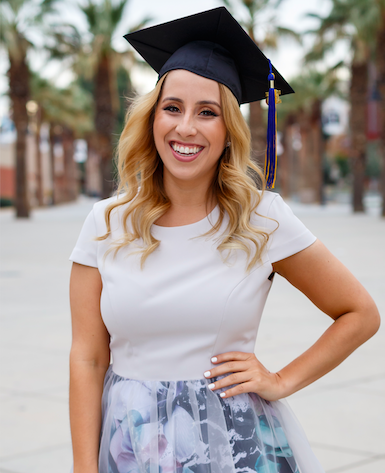 Hernandez graduated from San Jose State University (SJSU) with a degree in public relations and a minor in business in December 2015. She officially joined SJSU’s PRSSA Chapter as a committee member in 2013 and was elected to be the director of public relations in 2014. I chatted with Hernandez to see how her experience in PRSSA led her to the career she has today. She said PRSSA was a great experience for her and had a positive impact on her college and professional career. Q: What made you decide to join PRSSA? A: During my junior year at SJSU, I wanted to get more involved with the journalism department. I had just switched majors from kinesiology to public relations. I thought that joining a committee would help me develop friendships with students and faculty in the journalism department. When I first joined the Chapter in 2013, I never imagined I would join a committee. Once I got more comfortable in the committee, I applied to be the director of public relations for the Chapter. Q: You currently work as a marketing associate for a startup in California. What is something you find unique about working for a start-up as opposed to an established company? A: Startup companies have a tight-knit and family-oriented culture. There is a lot of collaboration, communication and strategizing in the day-to-day activities. When I worked for a larger company, the team was more disconnected and the communication was not as strong. In a startup, it’s easier to communicate with a co-worker because you work in a smaller space. You are able to learn how to be multi-faceted in a startup environment because there are many tasks that need to be handled immediately. Q: What is one thing you’ve learned as a young professional that you weren’t taught in the classroom? A: The biggest thing I learned as a young professional is how difficult it is to get your foot in the industry after college. In the classroom, you’re taught to dream big and work hard, which is fantastic! However, after I graduated from SJSU, I learned it takes persistence, a tailored resume, an eye-catching website portfolio and — most importantly — a strong professional network to help you get a job in the industry. Q: What advice would you give your younger self regarding professional and personal development? A: I would tell her to put in extra time working on personal projects outside the classroom. I worked hard in college, but looking back now I know I could have worked on personal projects to add to my portfolio. Repetition of a particular task, whether it be writing, designing or public speaking, needs to be practiced a lot. Q: How did the skills you developed as a member of PRSSA prepare you for the public relations industry? A: PRSSA helped me feel well-prepared and qualified when I started working in the public relations industry. I knew more or less what to expect as a young professional. PRSSA pushed its members to gain professional development through writing, internship experiences, corporate tours, event planning and networking. I was able to get out of my comfort zone in PRSSA, which helped me be confident once I stepped into the public relations industry. Q: What has been your favorite part of working in the public relations industry? A: I love how the public relations industry is up-to-date on the latest trends and news. It is an industry you can never get bored in because it is always changing. I have worked in startups, large corporations and agencies, which have all given me different and valuable experiences. Overall, my favorite part of working in the industry is that no work day is the same, and there is always a new task to conquer. Krista Watson is a junior at Loyola University Chicago and the PRSSA 2016–2017 Publications Editor in Chief. Follow her on Twitter @watson_krista or connect on LinkedIn. marketing, PRSSA, public relations, Startup, technology, Where Are They Now?